The UI theme designer is a browser-based tool that allows you to develop your themes by modifying one of the theme templates provided by SAP. Example − You can change the color scheme, or add your company’s logo. The tool provides a live preview of the theme while you are designing. Apply your corporate branding and look to applications built with SAP UI technologies. The UI theme designer is a browser-based tool for cross-theming scenarios. Use it to build your corporate identity themes easily by modifying one of the theme templates provided by SAP. For example, you can change the color scheme, or add your company’s logo. The tool is targeted at different user groups, including developers, visual designers, and administrators. The key features and benefits are as given below. Browser-based, graphical WYSIWYG editor − Change the values of theming parameters and immediately see how it affects the visualization of the selected preview page. Build-in preview pages − Select built-in preview pages to see what your custom theme will look like when it is applied to an application. Quick theming (basic cross-technology theme settings). Expert theming (technology-specific theme settings). Manual LESS or CSS editing. Cross-technology theming − Create one consistent theme that applies to various SAP UI clients and technologies. 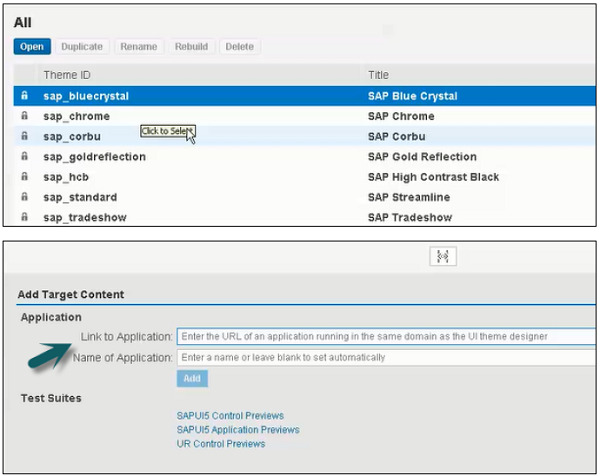 SAPUIS You can theme SAP standard libraries. Custom SAPUI5 libraries cannot be themed. NWBC for Desktop (4.0 or higher) − You can theme NWBC shell and overview pages (index page, new tab page, service map). NWBC for HTML (3.6) − You can theme the service map. The shell cannot be themed. How to Call Theme Designer in SAP Fiori? 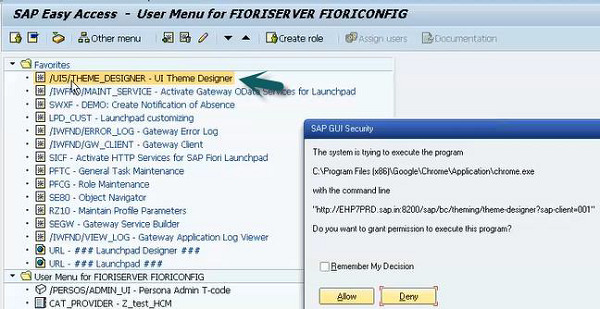 Login to SAP Fiori Front-end server. You can use T-Code: Theme Designer or use shortcut as shown below and login. Once you login, you will all the default templates provided by SAP for Theme Designer. Select the default theme and click Open. 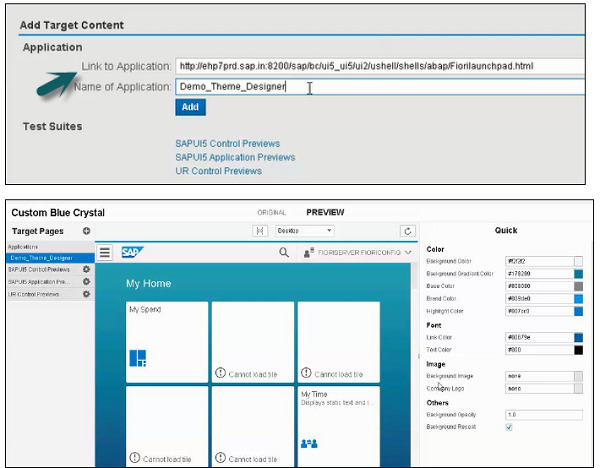 Enter the Fiori Launchpad link and Name of the application and click ADD. From right side, you can select Color, font, Image and other properties. You can edit colors as shown in the snapshot given below. To save the Theme click the save icon as shown below. You also have an option to save and build option. Once you select Save and Build, it will start saving and once it is completed, you will get a confirmation Save and Build completed. To get the link of this Custom Theme, use T-code:theme_tool. Select the Theme that you have created and click the Info tab. Use Ctrl+Y to copy the URL from the screen and make a note of this.